I can’t think of a much better place to relax than Bali. It’s beautiful, has many attractions, good food and it offers some excellent family accommodation in all price brackets. The appeal of Bali is in its amazing beaches, so the best Bali resorts for families take advantage of these. However, there are just as many options for families that want to ditch the sand for the pool or want to relax in Bali’s lush interior. Bali can be suited towards whatever you want, from the craziness of Kuta to the relaxing resort town of Sanur to the beautiful rice paddies surrounded Ubud, there is a hotel for you. Below you will find our choices for the top 12 Bali family accommodation as well as some great family villas and private holiday rentals. 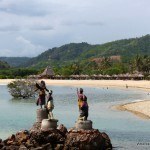 The resorts are grouped by the are in which they are situated in Bali. If you are wondering where to stay in Bali, keep reading! The Hard Rock Hotel has recently been renovated to become one of the top resorts in Bali. This well positioned Kuta hotel is within walking distance to many fantastic eateries, two shopping malls, bars and, of course, the beach. Like other Bali top hotels, it is just across the road from the entrance of the popular Kuta Beach. You will find an absolutely huge outdoor pool with a sand island at this hotel, and the kids will love the rock-climbing wall. The Kids Suite is the best room for families offering bunk beds for the kids and a PlayStation 3. As one of the best family hotels in Bali, a Kids/Teens Club provides games and activities, giving kids their much-needed private time. They can also sing at the hotel’s own recording studio! 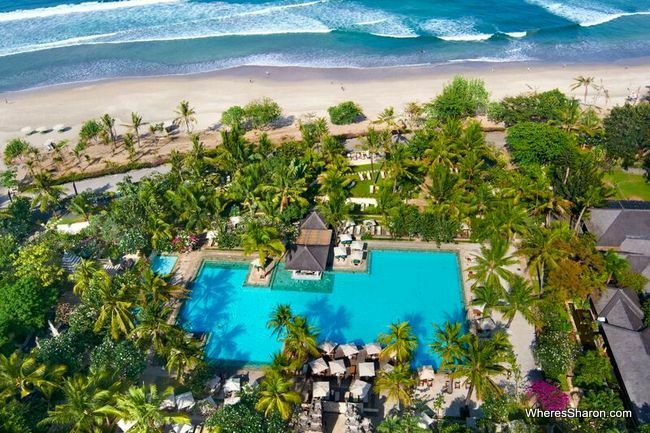 This Kuta hotels restaurants offer both Asian and Western dishes, and you can dine by the pool, or choose one of the many restaurants nearby. Live entertainment is also offered. The hotel is also conveniently close to airport. The Padma Resort is one of the best Bali resorts for families offering some Bali luxury accommodation. It is a truly welcoming place. The resort has its share of amazing pools including the Lagoon pool and Kids pool. 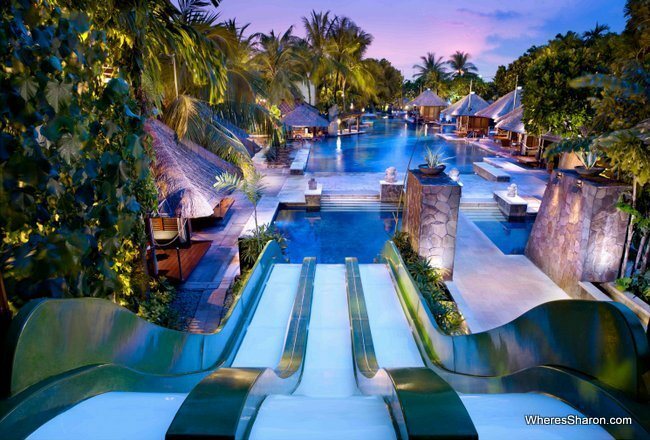 It also has a huge water slide to be enjoyed by both kids and adults which many top Bali hotels don’t have. The kids club is also available for when they need their space (or when you need yours). You can choose from deluxe to clubrooms, each with breakfast included. This resort also has interconnecting rooms for you and the kids to run between. There are good eating and drinking options in the resort and being within walking distance to Legian Street offers you many other options. 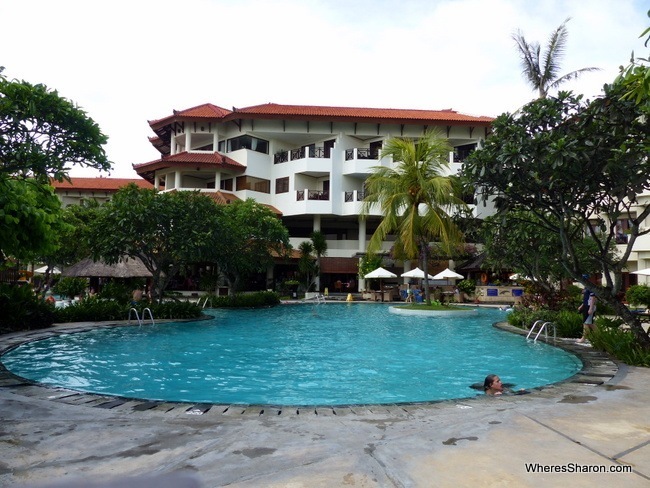 The Flora Kuta is a best place to stay in Bali with kids for people looking for a budget option. The location is handy in the middle of Kuta, only a 15 minute walk to the beach and its not far from the awesome Waterbom Bali. It has everything you need for a Bali holiday at a great price. The hotel features a pool, kids’ pool, pool bar, restaurant and a cafe. The resort is on the simple side and rooms can be aged, but the prices are great. The rooms are simple but nice. There are triple rooms as well as the option of booking a connecting room. 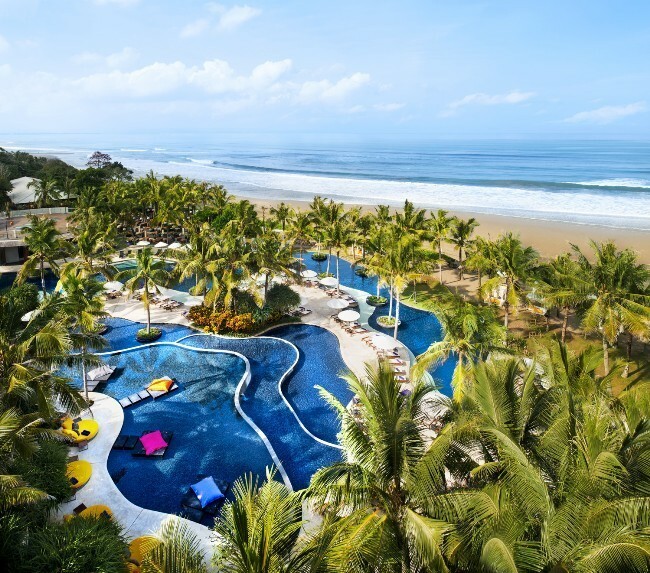 W Retreat and Spa resort offers warm pools and a relaxed surrounding, and as one of the best family resorts in Bali, a large clean beach free of vendors awaits. Woo Bar offer delicious drinks, both alcoholic and non-alcoholic for you and the kids to enjoy. Western and Asian cuisine can be found at its other restaurants, although there are also many eateries within walking distance. The offering of free treats, flavored water and juice for the kids from the lobby could make it the best family hotel in Bali by itself. As with other hotels in Seminyak Bali, the location couldn’t be better for shopping. 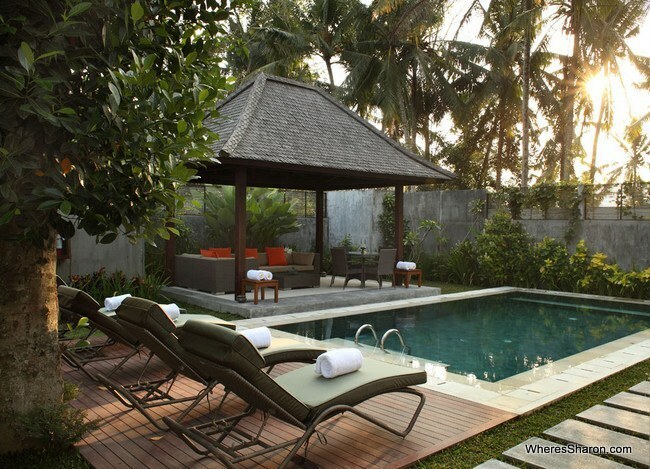 Offering Bali villa accommodation, the W Retreat and Spa offers both one and two bedroom Bali family villas. Each room features a balcony with garden/ocean view, DVD’s and a flat screen TV. Each villa also has their own private pool. The Samaya Villas Seminyak hotel is a true spa style resort for you to unwind with a sauna, pool, fitness center and massage services with treatments for both face and body. However, just because it offers luxury doesn’t mean it isn’t suitable for families. The hotel offers fantastic accommodation in Bali for families. This Seminyak hotel’s location is only a 5-minute stroll to the center of Seminyak, which is one of the best places in Bali for families to explore. The Samaya has some of the largest rooms of hotels in Seminyak. You can choose from enormous single, two and three bedroom villas each with their own outdoor seating area and private pool. These are not attached to the main hotel but rather individually positioned. The Breeze restaurant is award winning and serves amazing meals, however they are a little pricy. The little touches can make a place feel special and there are plenty at this resort, including luxury bath products and complimentary laundry service each day. There is also a complimentary shuttle for small distances. This is a great Bali family hotel. 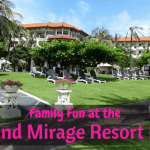 The Grand Mirage Resort is excellent. Situated right on the beach of Nusa Dua, the resort features friendly staff and a great atmosphere, as would be expected with the best Bali resort for families. Family deluxe rooms are a great option for families providing spacious layouts with well-equipped bathrooms. The rooms are either garden or ocean facing. The resort offers all-inclusive comfort with actives and games held for the kids all day. A cheap babysitting service is also offered for a small fee at night, and the kid’s fun clubroom can be enjoyed during the day. The resort has four eating options including (but not limited to) Italian, Asian and seafood options. There is live entertainment every night in the Panarama lounge and you can swim up to the pool bar. The amazing beachfront and family friendly staff easily makes this one of the best Bali resort for families. A small section of the long pool at the Samabe. It was hard work hanging out here!! 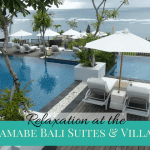 The Samabe Bali Suites & Villas also offers some fantastic Bali resort accommodation. With a choice from 81 suites/villas, you can choose the best villa in Bali for your family. The villas are very well equipped with both a living and dining area, and open up onto a private terrace/balcony. Family packages are available at this family resort in Bali with breakfast for all included and a complimentary babysitting service provided. Kids are also provided with an activity kit on arrival. The Rempah Restaurant serves a variety of cuisine including Balinese, Indonesian, Asian and Mediterranean dishes. The Chrystal Blue Ocean Grill also serves great meals. However, this Bali resort for family is far from other eating options. The outdoor pool is great and there is also a spa and gym. Close to the airport with direct, private beach access, the hotel is quiet and positioned over a huge location. The beach is also one of the best beaches in Bali for families as it is so quiet. 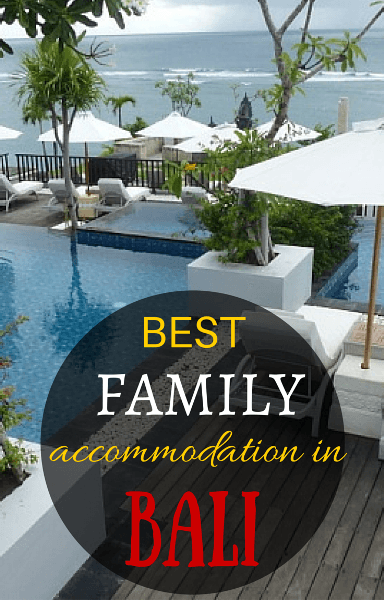 This resort offers perfect accommodation in Bali for families. Read our full review or click here for the latest prices. The Peneeda View Beach Hotel features traditional Balinese style rooms set out on a private beach with no hassle from vendors, shrouded in gardens within the quiet resort town of Sanur. Making the Peneeda one of the best Bali hotels for families is the four large pools that can be found on the hotel grounds. The pool bar serves drinks that are well priced, and there is entertainment at night. The Lambongan Restaurant serves both local and Western meals, but there are many other eating options a short stroll away, along with massage and shopping too. You have a range of choices for accommodation from a private bungalow or a two-bedroom family suite with daybeds for lounging. 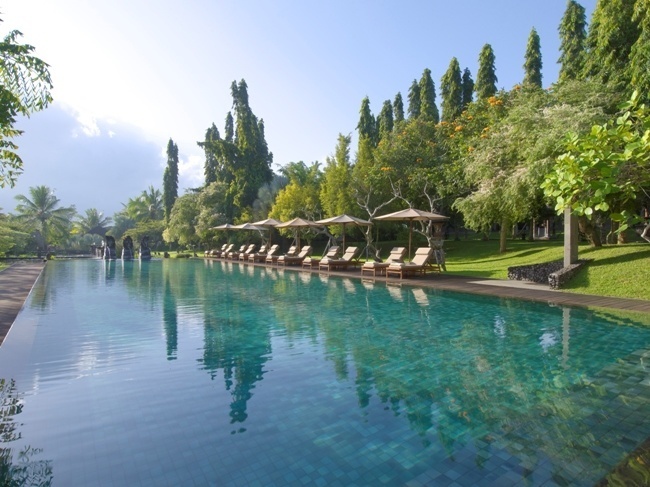 If you want a hotel away from the hassle, this one of the best hotels in Bali for families. 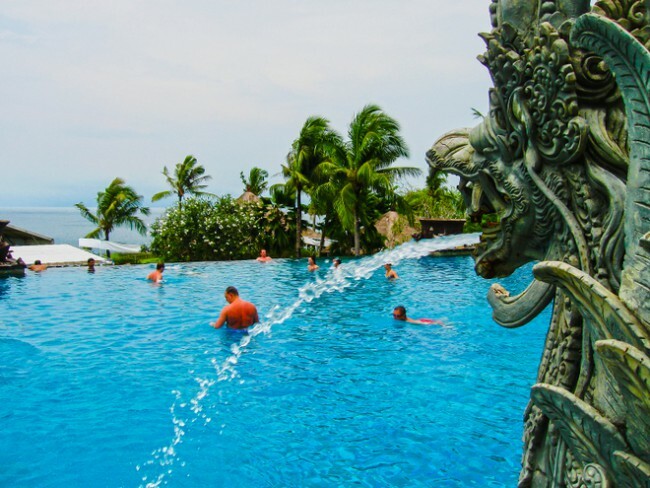 The Fairmont Sanur Beach hotel offers great Bali accommodation for families in an ideal position that scores well in Bali hotel reviews. 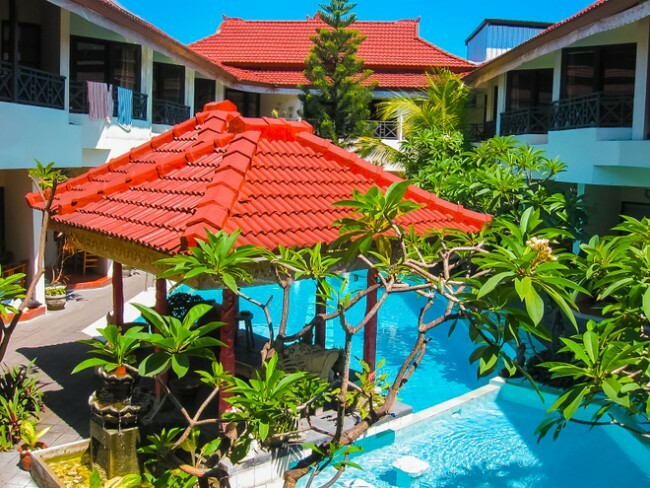 The Sanur hotel facilities are excellent with a grand pool and underground kids club located between tropical gardens, and walking distance to the beach. There is also a library, spa and gym for parents. The hotel is close to the golf course, which will surely make it one of the best Bali resorts for families for many dads. The villas are private and large in size with individual access to pool. They also offer some of the largest Bali accommodation for families with three bedroom villas available. Although well equipped, they lack their own laundry. The Grill restaurant and Layang Layang both serve meals, however these are a little over priced and it’s easy to eat out. Coffee and tea is served in the lounge. This is one of the best Bali family resorts offering some of the best family accommodation in Bali. The Samaya Resort in Ubud is a sister property to the Seminyak Samaya property above. With the hotel in Ubud located outside of central Ubud, this is a great option surrounded by hillside. The thing that makes this resort one of the best family resorts in Bali has to be its villas. Each villa is large and has well equipped bathrooms with a spa bath. It offers one-bedroom villas, complete with private pools. This Bali family resort has a wine cellar, restaurant serving fresh seafood and a bar for evening drinks. This hotel also serves the most amazing breakfast out of all family resorts in Bali. However, watch out for sandflies around the hotel and bring insect repellent. Although the resort is far from the beach, it is the best family resort in Bali for those that prefer the pool. The Chedi Club hotel is one of the best family hotels in Bali for those families that prefer time by the pool rather than the beach. This top hotel in Bali has paid great attention to detail, both in its design and in the staff. This hotel is surrounded by rice fields and outside of central Ubud, but with a shuttle bus for service between. The huge 28 meter outdoor pool overlooks the lush surroundings, and the hotel offers activities for kids, and treks into the rice fields. The restaurant and Club Lounge serve Asian and Western dishes with fresh local ingredients. The rooms are large with private terraces, entertainment systems and some with a private pool. You can choose from one bedroom villas, suits and pool rooms. 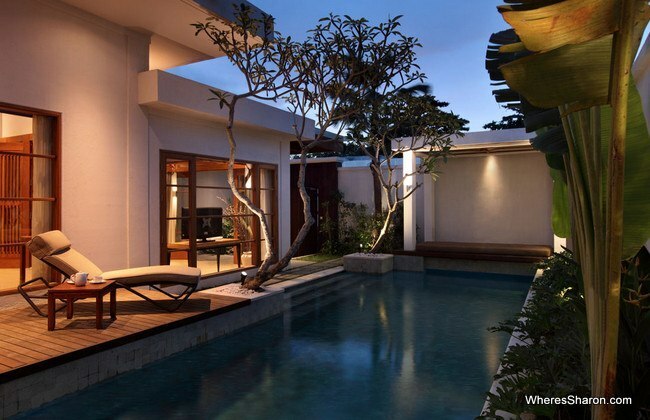 Pool villa would definitely be my preference and are one of the best villas in Bali for families. This is the perfect Bali family resort to relax and unwind away from other hotels. The Ritz-Carlton Bali – top 5 star choice in Nusa Dua with some amazing villas and suites, perfect if you want some space. More information here. Eden Hotel – located in Kuta, offering ‘Family fun packages’. More information here. Mantra Sakala Resort & Beach Club – located in Nasu Dua, offering two-bedroom villas and suites. More information here. 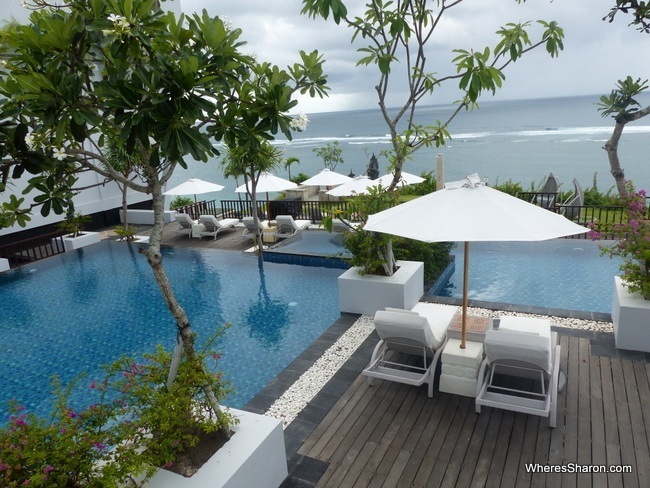 The Haven Bali – located in Seminyak – offering two bedroom suites. More information here. Karma Kandara Villa – located in Uluwatu – offering two/three-bedroom villas. More information here. Hanging Gardens Ubud Hotel – located in Ubud, offering deluxe family villas. More information here. 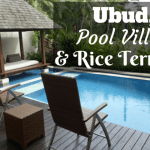 If you are looking for great value Bali family villas or other family friendly Bali accommodation why not consider an apartment? An apartment provides more space as well as facilities like a kitchen and washing machine for a much lower per night price than a hotel. We find that AirBnB apartments offer great value and have the widest collection of apartments on the web. Don’t have an AirBnB account? Then please use this link to sign up and we will both get $45 off our next AirBnB stay! https://www.airbnb.com.au/rooms/3775442 – beautiful 3BR, 4 bathroom villa with its own pool and beautiful views over the nearby rice paddies in Ubud. It’s serviced and cleaned daily. We stayed here previously and loved it. https://www.airbnb.com.au/rooms/794002 – beautiful 2BR villa in Lovina. Close walk to the beach and main areas with a lovely private pool and daily cleaning. 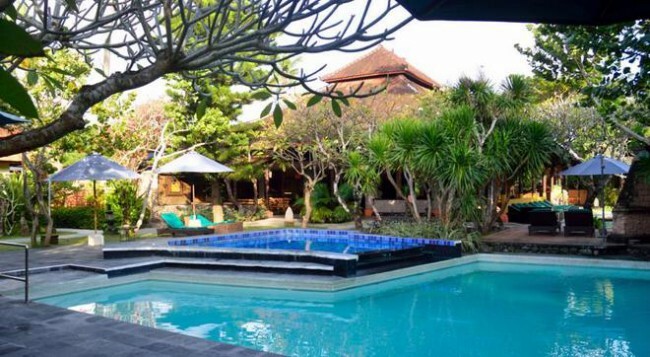 https://www.airbnb.com.au/rooms/929991 – 3BR villa in a good location in Seminyak. Outdoor living with indoor bedrooms. Small, private pool. We hope this has been helpful. 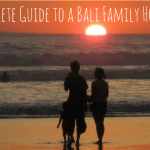 Please also check out our full guide to visiting Bali with kids which includes a long list of the best attractions and activities for families. Bali is so nice! The links you shared is so useful. Gonna save it for my next coming trip. Thanks for sharing. If you make a list of kids activities in Bali… can you include us? how do we join a list? We recently opened the SuperHero Factory Bali, a parkour and freerun inspired gym and playground for all ages. Website is here http://www.shfbali.com. We also run team building retreats for kids (and adults)… facing your fears and overcoming them.. Hope to hear from you soon.